Single User access for Scottish Highers for use by students or teachers wherever and whenever they wish. Institutions may buy any number of single users in one purchase. Examples 5 users = £50 + vat; 10 users = £100 + vat. Alternatively, there are the 50 user and Institution licences available. Scottish Advanced Highers is also available - subscribe to both together via Option 1 £20 + vat per year. Prices quoted are for annual subscription. 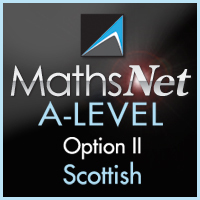 MathsNet Scottish Highers 50 User Subscription. Floating licence, any 50 concurrent accesses at any one time by staff and students of the purchasing academic institution, providing access whether at academic institution, roaming or at home. Any 50 students at any one time can use this type of subscription to study and revise, but please be aware that if you want to use the assessment system to track the activity and results of 50 particular students, then access will need to be limited to those 50. To track more than 50 you need the Institution Subscription. Prices quoted are for annual subscription. If you'd prefer to be invoiced rather than order online with a credit or charge card just send your official purchase order to us at Chartwell-Yorke, 114 High St, Belmont Village, Bolton, Lancs, BL7 8AL, UK, orders@chartwellyorke.com.